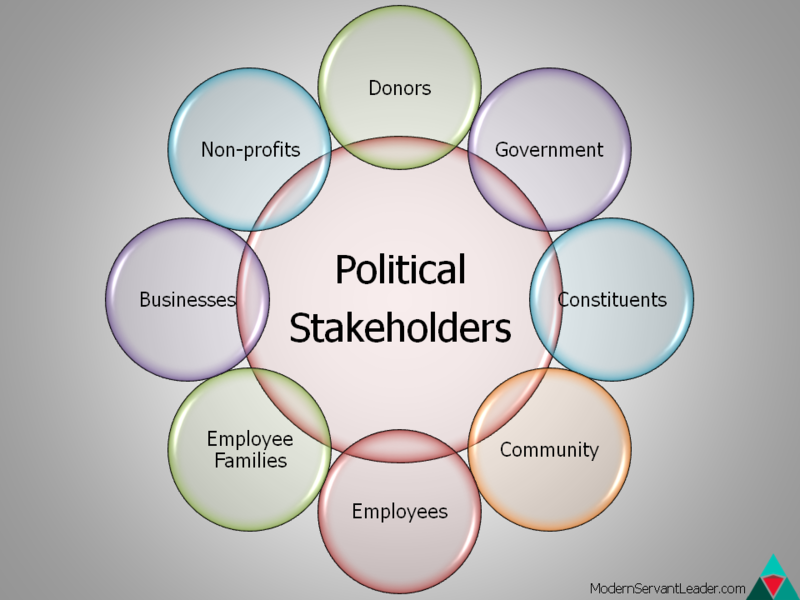 A stakeholder is anyone with a vested interest in your organization and leadership. Too often, leaders make decisions without considering all stakeholders. The for-profit sector focuses too much on investors. Nonprofits focus too much on their clients. Politicians often focus on their own constituents at the exclusion of others. 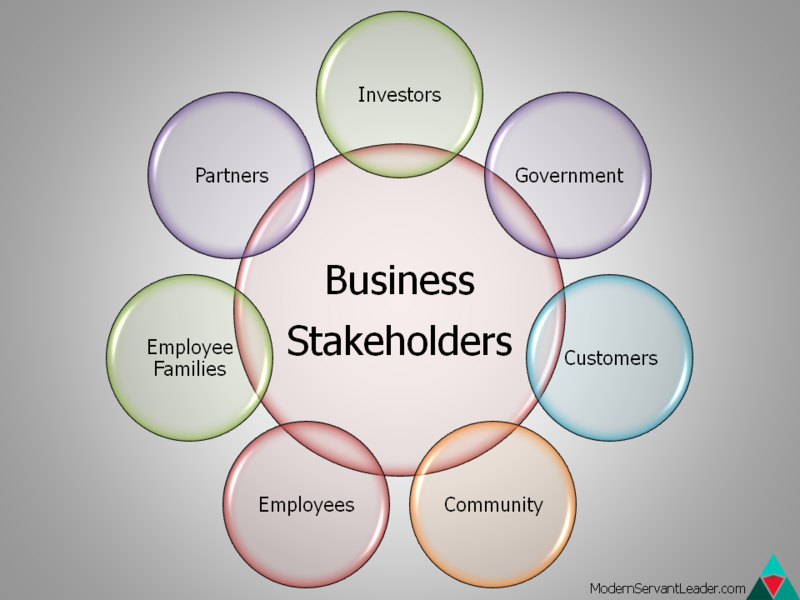 As a leader in your organization, you should become more familiar with the term, “stakeholder” because that is who you should serve – all stakeholders. Servant leadership requires a focus on all stakeholders. 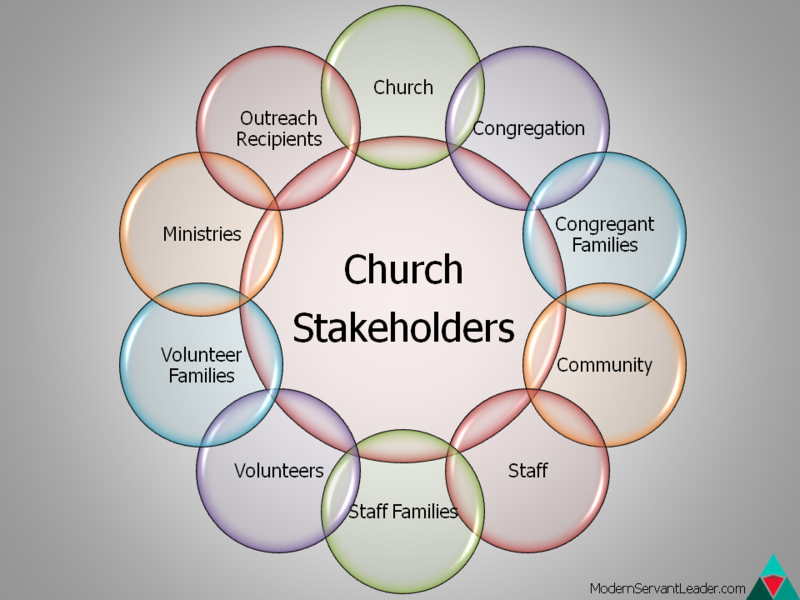 Who are all your stakeholders? Identify your stakeholders from two angles: those invested in your organization and those impacted by your organization. The following stakeholder groups invest something in your organization. Their stake is determined by their sacrifice and contribution to the success or failure of the organization. Investors: Shareholders, owners and public investors invest money. These individuals may also invest time and expertise into your work. Employees: Employees, whether compensated or voluntary, invest time and energy in your mission. The best of these individuals also invest a lot of passion. Partners: Suppliers, joint ventures and contracted parties also invest something in your organization. Whether it is components of your products or services that help you succeed, partners also have a stake in the organization. Other stakeholder groups are impacted by your organization. While these individuals may not invest directly in the mission, they are impacted by your actions and results. Community: Your physical community is impacted by land use and the people that comprise your organization. The logical community is also impacted by association – these include members of your field and industry. Social Cause: Whether it is a charity or investment in the environment, how you impact social causes also creates stakeholder groups. Employee Families: Families of your employees are all impacted by your organization. These impacts include the time they give up with loved ones, the demeanor of employee when they return home and, of course, the salary and benefits. When making decisions, consider all these stakeholders. True Servant Leadership requires this broad perspective. Instead of talking about your customers, clients or constituents, use the term, “Stakeholder” to remind yourself and others of your full accountability. 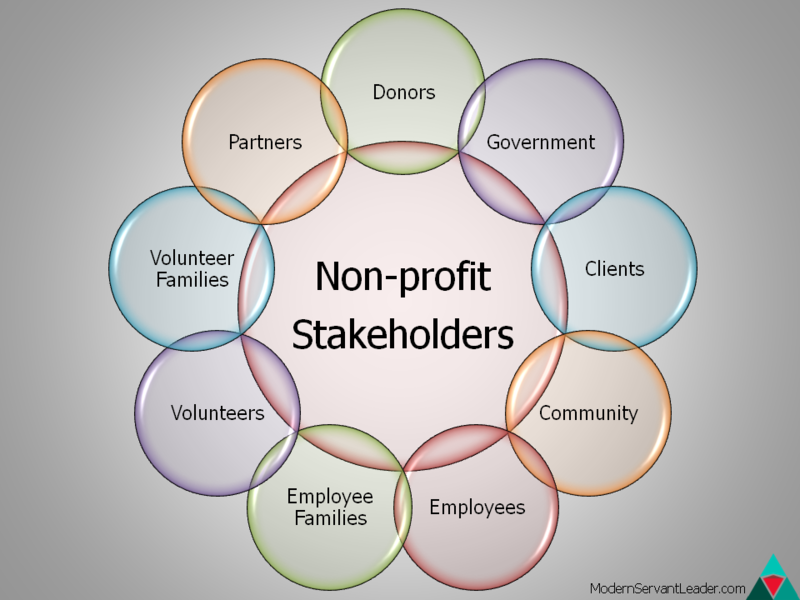 Below are 4 stakeholder circles to help you envision this approach. Feel free to download and share them. 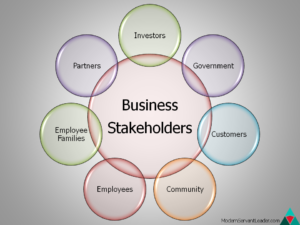 Business stakeholders include: Investors, government, customers, community, employees, employee families and partners. 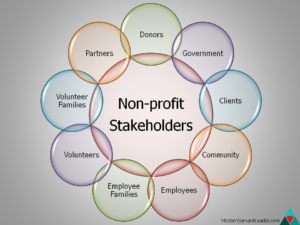 Nonprofit stakeholders include: Donors, government, clients, community, employees, employee families, volunteers, volunteer families and partners. 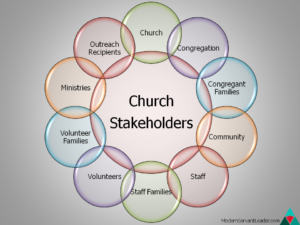 Church stakeholders include: the broader church, congregation, congregant families, community, staff, staff families, volunteers, volunteer families, ministries and outreach recipients. 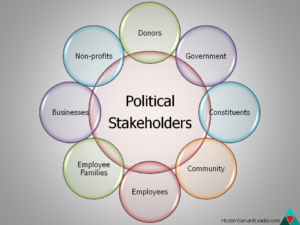 Political stakeholders include: donors, government, constituents, community, employees, employee families, businesses and nonprofits. Question: What stakeholders did I miss in any of these groups? If you lead, you will eventually serve with Judas or Peter.